Apperley Methodist Chapel stands in a beautiful rural setting on the south side of the Village, on high ground not far from the River Severn. The red brick building was erected in 1904 superseding the old Moravian Chapel on the same site, which is now a private residence. Refurbishment carried out in 2003 provided kitchen and toilet facilities, improved heating, and wheelchair access. 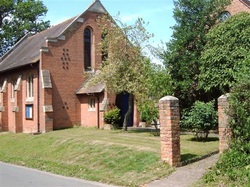 The Chapel can accommodate a congregation of about 64 with car parking alongside for about 10 cars. Additional parking is available on the cricket club field, 150 metres up the lane.. Morning services are currently held at 11am on the 2nd, 4th, and 5th Sundays each month which complement services on the 1st and 3rd Sundays at the Anglican Church thus providing one service in the village every week. United services and other joint ventures such as Lent courses, children’s holiday activity days, and other special anniversaries are frequently shared by the two Churches as they arise. Sunday Worship is usually of a traditional style but with a bright atmosphere and mixture of modern and traditional music. The congregation is made up of residents of Apperley and other villages round about as there are no other Chapels between Tewkesbury, Cheltenham and Gloucester. On most Tuesday mornings Bizzy Fingers group meets from 10am in the Chapel when ladies from around the area knit articles specifically to go to babycare units and children’s charities both at home and abroad. Other crafts are also enjoyed by those who do not knit. For further information visit Tewkesbury & Apperley Methodist Churches.